This photo of Tropical Storm Marie was captured by NOAA's GOES-West satellite on August 28, 2014, the same day the storm was downgraded from hurricane status. A NASA satellite has captured the once-mighty Hurricane Marie losing steam over the cool waters of the eastern Pacific Ocean. NASA's GOES-West satellite snapped a photo of Marie at 11:00 a.m. EDT (1500 GMT) Thursday (Aug. 28), the same day the maelstrom was downgraded from a hurricane to a tropical storm. Marie was about 865 miles (1,395 kilometers) west of Punta Eugenia, Mexico, and moving northwest at 15 mph (24 km/h) when the picture was taken, NASA officials said. Infrared data gathered by another NASA Earth-observation spacecraft, the Aqua satellite, further showed that the tops of Marie's clouds had warmed, meaning that the storm's clouds aren't getting as high up into the atmosphere as they did before. "The higher the thunderstorms, the stronger they usually are, but Marie's are dropping in height," NASA's Rob Gutro wrote in a description of the new photo, which was released Thursday. "Marie is not able to generate strong thunderstorms because it has moved over cooler waters," Gutro added. "Sea surface temperatures of at least 80 F (26.6 C) are needed to maintain a hurricane's strength. Marie is in waters as cool as 22C (71.6F)." Though Marie appears to be petering out, the storm could continue pounding the west coasts of Mexico and the United States with powerful waves through Friday (Aug. 29), experts say. Marie's swells have already caused significant damage in some areas, such as Catalina Island, which is just west of Los Angeles. 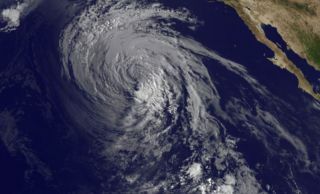 Marie was born as a tropical depression off the southwest coast of Mexico late on Aug. 21, then strengthened into a tropical storm a few hours later. Marie was re-classified as a hurricane on Aug. 23, eventually attaining a Category 5 designation. Category 5 hurricanes are the strongest type, with winds of at least 157 mph (252 km/h).